The nation’s Hispanic population has long been characterized by its immigrant roots. But as immigration from Latin America slows, the immigrant share among each of the nation’s Hispanic origin groups is in decline, according to a new Pew Research Center analysis of U.S. Census Bureau data. This report explores data of the 14 largest Hispanic origin groups, unless otherwise noted. The foreign-born share of Salvadorans, for example, fell from 76% in 2000 to 59% in 2013—the largest percentage point decline of any of the six largest Hispanic origin groups. Similarly, Dominicans, Guatemalans, and Colombians all had decreases of over 13 percentage points in their foreign-born shares over the same period. Mexicans, the nation’s largest Hispanic origin group, also saw a decline, though it was only 8 percentage points since 2000. 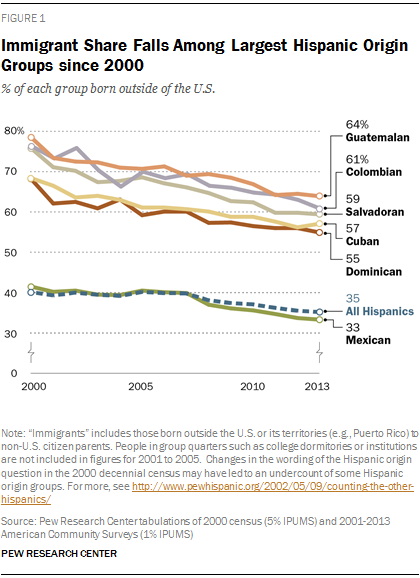 A decline is underway among smaller Hispanic origin groups, too (see Appendix Table A1). Overall, the share of the Hispanic population that is foreign born has decreased from 40% in 2000 to 35% in 2013. Despite falling immigrant shares across all Latino origin groups, fast Latino population growth has led to continued growth in the number of Latino immigrants (though growth has slowed in recent years). Among all Latinos, there were 14.1 million immigrants in 2000. By 2005, that number reached 16.8 million, and by 2013, there were 19 million Latino immigrants in the U.S. The same pattern is present among all Latino origin groups, though for three—Ecuadorians, Mexicans and Nicaraguans—the number of immigrants has declined since 2010 (for details, see Appendix Table A2). The nation’s Latino population is its largest minority group, numbering more than 53 million, or 17.1% of the U.S. population, in 2013. It is also diverse in a number of ways. While Mexicans are by far the largest origin group at 34.6 million (making up 64.1% of all U.S. Latinos), the nation’s Latinos trace their roots to every part of Latin America. For example, Puerto Ricans are the second-largest Latino origin group and represent about 9.5% of all U.S. Latinos.1 Beyond these two groups, no other makes up more than 5% of the U.S. Latino population. Cubans and Salvadorans, the two next largest groups, each make up just under 4% of the Latino population, with populations of about 2 million each. Even though the foreign-born share is declining among each Hispanic origin group, the share that is foreign born varies widely across them. Venezuelans had the highest foreign-born share, at 69% in 2013. They are followed by Peruvians at 65%, Guatemalans at 64% and Hondurans at 63%. Only Mexicans (33%), Spaniards (14%) and Puerto Ricans (2%) have foreign-born shares of less than half of their total population. When it comes to U.S. citizenship, about three-in-four Hispanics (76%) are either U.S.-born (65%) or naturalized U.S. citizens (11%). Among the origin groups, those with the highest citizenship rates are Puerto Ricans (99%),2 Spaniards (93%), Cubans (76%) and Mexicans (75%). By comparison, Hondurans and Guatemalans have the lowest rates of citizenship, at about 50%. The 14 largest Hispanic origin groups differ in other ways, too. Mexicans, for example, have the lowest median age, at 26 in 2013, while Cubans are the oldest with a median age of 40. Hispanics on the whole are younger than the general U.S. population, with median ages of 28 and 37, respectively. In terms of educational attainment, Venezuelans are the most likely to be college-educated, with half of Venezuelans ages 25 and older having completed a bachelor’s degree or more. By comparison, Salvadorans (8%), Hondurans (9%) and Guatemalans (9%) have the lowest share of adults ages 25 and older with a college degree. The U.S. population overall is twice as likely as Hispanics overall to have earned a bachelor’s degree or more—at 30% and 14%, respectively. On language use, according to U.S. Census Bureau data, fully 68% of all U.S. Hispanics ages 5 and older speak only English in their homes or speak English “very well”—a new high reflecting the rise in English proficiency among Hispanics (Krogstad, Stepler and Lopez, 2015). Among Hispanic adults, one-quarter indicate they are English-dominant, 38% are Spanish-dominant, and 36% are bilingual (Krogstad and Gonzalez-Barrera, 2015), according to a 2013 Pew Research Center survey of Hispanics.3 Among the five largest Hispanic origin groups, 84% of Puerto Ricans speak only English or are bilingual—a higher share than Mexicans, Dominicans, Cubans or Salvadorans. Meanwhile, just 37% of Salvadoran adults speak either English or are bilingual, among the lowest share of the five largest Hispanic origin groups. Argentineans have the highest median household income at $63,000, about $20,000 higher than the median household income of all Hispanics ($41,000). Overall, one-quarter of Hispanics live below the poverty line—higher than the 16% poverty rate among the general U.S. population. Guatemalans, Hondurans and Dominicans have the highest share of people living below the poverty line, at 28% each. Additional comparisons and rankings of the nation’s largest Hispanic origin groups are shown in the appendix of this report. And the interactive graphic accompanying this report compares and ranks these groups on a number of demographic and economic characteristics. “U.S. born” refers to those born in the U.S., Puerto Rico or other U.S. territories and those born abroad to at least one parent who was a U.S. citizen. “Foreign born” refers to people born outside the U.S., Puerto Rico or other U.S. territories to parents neither of whom was a U.S. citizen. It also includes immigrants who are in the U.S. legally and immigrants who are in the U.S. without authorization. The terms “foreign born” and “immigrant” are used interchangeably. “Speaking English proficiently” or “English proficiency” refers to those who speak only English at home or those who speak a language other than English at home but indicate they speak English “very well,” the highest response category on a four-point scale of English speaking ability. Those who do not speak English proficiently include those who speak a language other than English at home and indicate they do not speak English or that they speak English “well” or “not very well.” This information is self-reported in U.S. Census Bureau surveys such as the American Community Survey.